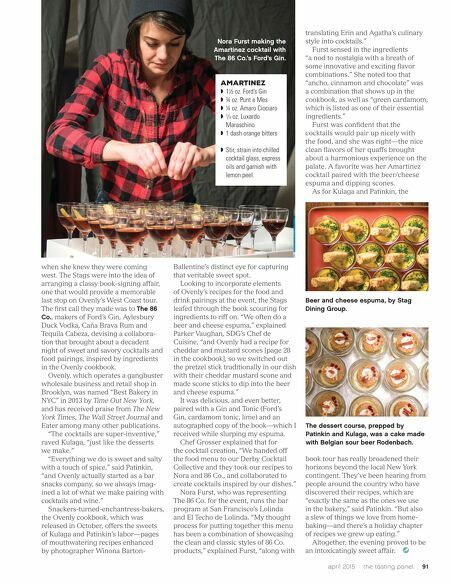 90 / the tasting panel / april 2015 N ora Furst, voted 2015 "Best Bartender in San Francisco" by 7x7 magazine, was finishing up the prep on her first round of cocktails as guests began to trickle into the hidden boiler room at Heath Ceramics in San Francisco's Mission district. A myriad of smells filled the air—Chef Jordan Grosser, Executive Chef of the Stag Dining Group (SDG), a San Francisco supper club known for its Clandestine Dinner Series, was busy with his team plating a Dungeness crab bao bun, the first of several passed plates. Erin Patinkin and Agatha Kulaga, proprietors of Ovenly, the Brooklyn-based bakery, and authors of the newly minted Ovenly: Sweet and Salty Recipes from New York's Most Creative Bakery (Harlequin, $29.95), were preparing a stack of books for autograph signing. 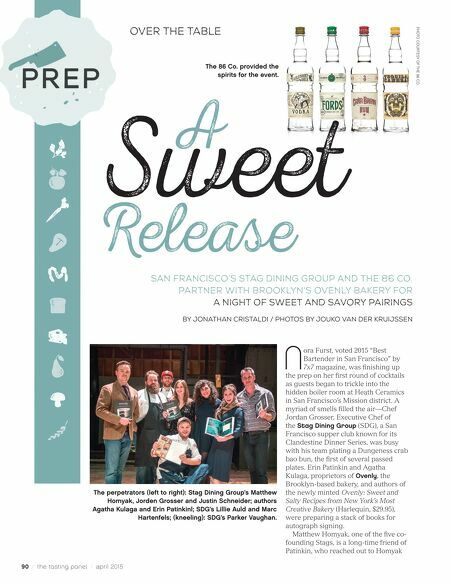 Matthew Homyak, one of the five co- founding Stags, is a long-time friend of Patinkin, who reached out to Homyak OVER THE TABLE A Sweet Release SAN FRANCISCO'S STAG DINING GROUP AND THE 86 CO. PARTNER WITH BROOKLYN'S OVENLY BAKERY FOR A NIGHT OF SWEET AND SAVORY PAIRINGS by Jonathan Cristaldi / photos by Jouko van der Kruijssen A K N O R T W X B I L The 86 Co. provided the spirits for the event. PHOTO COURTESY OF THE 86 CO. The perpetrators (left to right): Stag Dining Group's Matthew Homyak, Jorden Grosser and Justin Schneider; authors Agatha Kulaga and Erin Patinkinl; SDG's Lillie Auld and Marc Hartenfels; (kneeling): SDG's Parker Vaughan.